“Volunteering gets you out of the house in the morning – it makes you feel like part of society. In short, it makes you feel human because it gives you a purpose – you are doing something constructive with your life”. These are the words of Jenny, a former volunteer who is now a member of the Children’s Work staff at YMCA Hawker in Kingston. Jenny had been unemployed for almost two years when she got involved with Volunteering for All, a new piloting project that aims to empower homeless people to turn their lives around through volunteering in short-term placements that reflect their interests. The programme involves structured training and one to one mentor support, and is initiated by YMCA LSW in partnership with partnership with Kingston Churches Action on Homelessness (KCAH), Kingston Chamber of Commerce, Job Centre Kingston and the Royal Borough of Kingston. “The programme is really good,” says Jenny. Seven people from the Kingston and Surbiton areas took part in the pilot scheme before Christmas. Five individuals ended up getting a volunteer role within a field of their interest whilst another is on the verge of starting their placement. “We were actually asked what we would like to do and that’s the difference between this and other schemes. At the Job Centre, they just assume you would take any job, or any volunteer role, and they never actually ask you what you like doing,” Jenny explains. Volunteering for All is focused on short term volunteer placements of up to four weeks. Jenny, however, ended up volunteering for several months at the After School Club at YMCA Hawker where she did her placement, because she enjoyed it so much, and because the staff and children didn’t want to let her go. Now, she is a formal member of the bank staff. In addition, Jenny is working as a Teaching Assistant at West Wimbledon Primary School once a week, as a part of her course. Although she hopes to get a full time Teaching Assistant job when she finishes her course, she’d love to keep on working for the After School Club at YMCA Hawker in the school holidays. 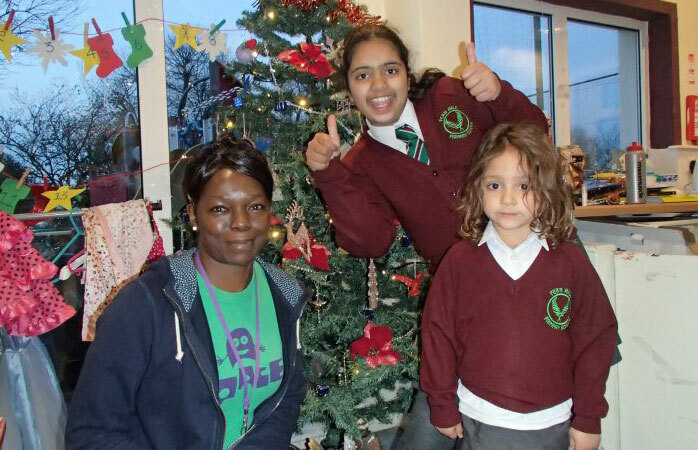 “The Children’s work team made me feel very welcome and as a part of the team since day one,” Jenny says. “I like working with children because they are the future, and it’s so interesting listening to their thoughts. You can learn a lot from working with children! Also, every day is different, and compared to the school, where everything is very structured, the After School Club is more free, which is great”. Jenny wouldn’t have been where she is today without the Volunteering for All scheme. She feels that the programme gave her another chance, and by working closely with her to find a volunteer job where she could use her talents, Jenny feels that through Volunteering for All, she got her confidence back. “I think the Volunteering for All programme gave all the volunteers their confidence back, it gave us a boost. Most of the time, when you are on the dole, you are just expected to do any job, even if it’s not something that suits you, and that can be a real motivation and confidence breaker”.